The scene at Cabin 82 at Graduate Oxford. All photos by Daniel Schwartz. This week we're celebrating small cities in the United States, making our way through charming college towns in the American South. Our first stop was Charlottesville, Virginia, for orchards, wineries, and a dose of Colonial history. Now we're turning our sights to Oxford, Mississippi, where we found a sophisticated crowd that really loves its football. 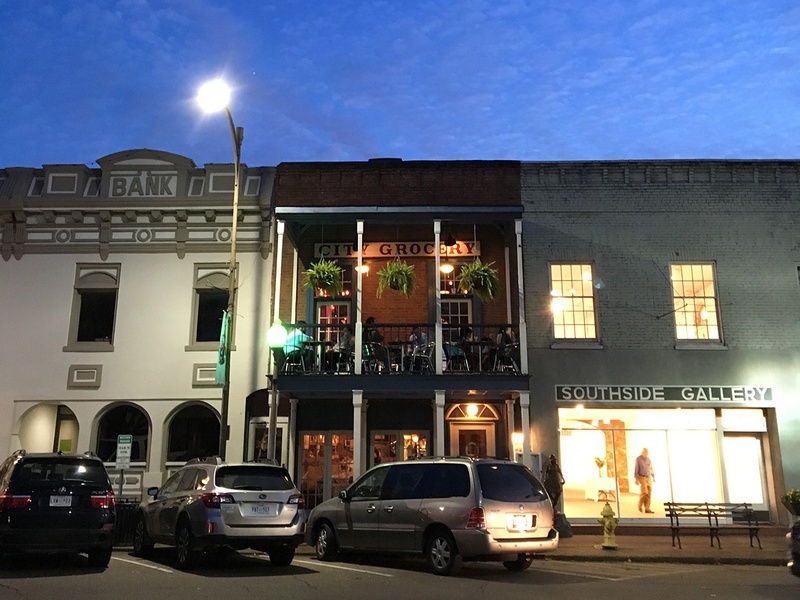 OXFORD, Mississippi – I landed in Memphis, my first foray into the Mid-South, an area that encompasses parts of Tennessee, Arkansas, Missouri, Kentucky, and Mississippi, and followed my driver, an older gentleman in overalls, into an air-conditioned Lexus. We exchanged cordial conversation about the weather — high 70s and humid in November — for the 80-mile drive to Oxford, Mississippi, where I spent the weekend as a guest of the new hotel. During conversational lows, I glimpsed small streams, crowds of cattle, and rusty, single-pump Chevron stations. As we approached Oxford, gaudy gated communities with names like Steeple Chase seemed to appear out of nowhere. On that stretch of Highway 6, I couldn't have felt farther from my home in Queens, New York. As an open-minded traveler, I was thrilled. 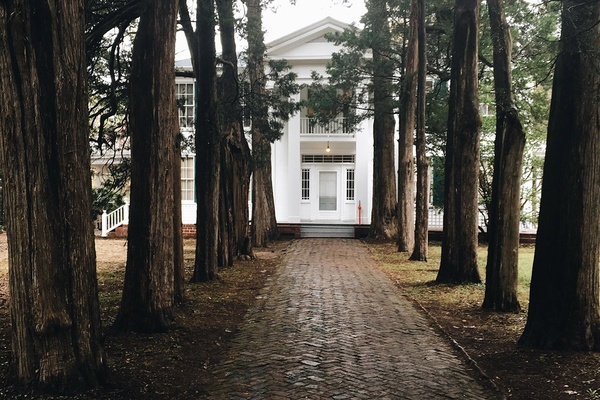 Oxford is home to the University of Mississippi, and the atmosphere is sophisticated, as befits an historic college town. 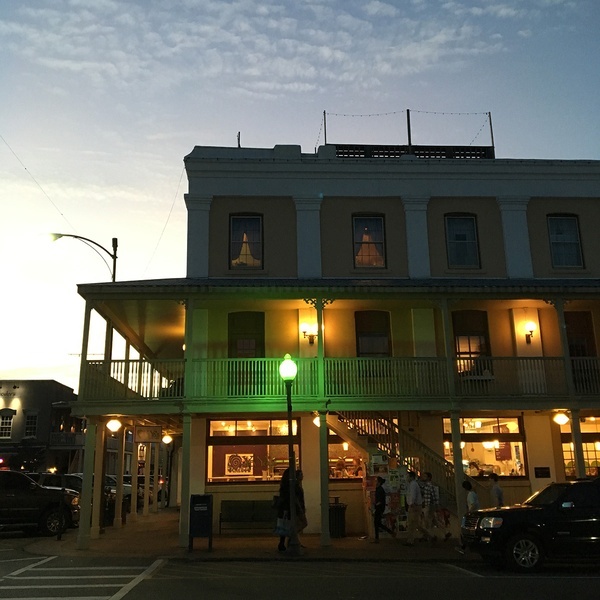 The scene is dominated by boutiques and art galleries, , the oldest department store in the South, and five eateries by James Beard Award-winning chef John Currence. The men wear jackets, white slacks, and tucked-in checkered shirts; the women are well-dressed Southern beauties. I was told that in the late '50s, after consecutive Miss Americas were crowned from Mississippi, all the pageant hopefuls from the region migrated to the state, and from the looks of it, they had stayed and had really great-looking kids. I got the feeling that if you were from the area and had money to move (then and now), you're coming to Oxford. The square, the social hub of town, is all porticos and small buildings in yellows, blues, and whites. A courthouse sits in the center, a replica of the original that was burned during the Civil War. The city's main shops and restaurants line the square and Lamar Boulevard, the main drag through town. Antebellum mansions in Italianate and Greek Revival styles — like Cedar Oaks and Shadowlawn, which were designed by William Turner, and Ammadelle, designed by Calvert Vaux (co-designer of Central Park) — interrupt the slightly smaller surrounding homes, which are decorated with charming real flame lanterns. Oxford is famous for its literary legends — sports writer Wright Thompson, John Grisham, and, most notably, William Faulkner, the late Nobel Prize laureate, a complicated and reclusive sort, who is still a source of inspiration in bookstores, at his former home, and at his gravesite, which is covered with half-empty bottles of whiskey, his favorite spirit. But Oxford may be better known (at least in the area) for the Ole Miss Rebels, a leading college football team in the Southeast Conference. The squad has ushered many alums into the NFL, including the Manning family: Archie and son Eli. They still have a house outside town. The view of the courthouse from Graduate Oxford. Photo by Christian Horan Photography. Businesses in the town square. Photo by Daniel Schwartz. Town square colors. At night, old lamps tint the scene green. Photo by Daniel Schwartz. 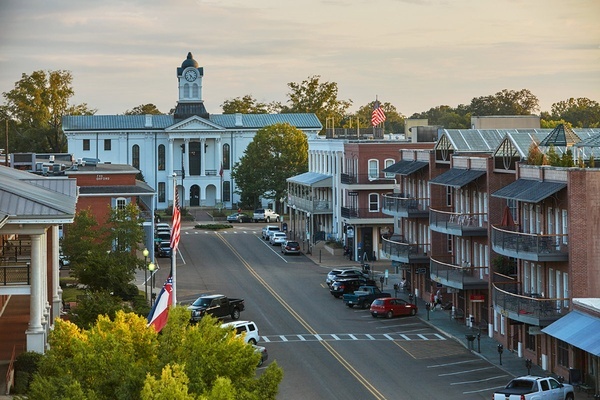 Oxford is in Lafayette County in the hill country of northern Mississippi, eighty miles south of Memphis, sixty miles east of the Mississippi Delta, and 350 miles (six hours by car) north of New Orleans. The city is located on the , which traces the roots of American music throughout the state. Everything in Oxford is within walking distance. Dining and nightlife are concentrated in the square. The university and football stadium are a fifteen-minute walk from the courthouse. The first thing I did in Oxford was attend , a weekly program showcasing Southern talent through readings, talks, and musical performances. The radio shows is recorded live at Off Square Books, the lifestyle arm of the historic three-store bookshop , and airs Saturday nights on . Before I had the chance to unpack, much less take my introductory walk around town, I was three rows from the podium, under weak fans, surrounded by established members of the community, many of whom owned local businesses and all of whom knew each other. They could tell I was an outsider, but I felt welcome. The lights dimmed, the house band started playing, the show began, and I started taking mental notes. The crowd clapped hard for home-grown award-winning sports writer Wright Thompson and laughed in self-reflection as British author , who moved from Manhattan to the Delta, noted the peculiarities of the local culture in his latest, . Guests smiled as the only child in the audience, a little African-American girl with a princess crown and a wand, walked up and stared at Aaron Lee Tasjan, the most unorthodox chap in the house. The musician, recently profiled in Rolling Stones, wore a trucker hat, loose jeans, and a flower pinned to his brown cardigan. The audience didn't care, and gave the howling solo performer a standing ovation. The home of William Faulkner, Rowan Oak. Photo by Daniel Schwartz. I'm a big fan of history tours in small towns. Manageable in scope, they help me understand a place and its roots, as old houses, forgettable statues, and ordinary storefronts are given context from the background into the narrative of local life. offers a historic Double Decker Bus Tour led by local docent Jack Mayfield that starts at their office and leads to the square, campus, and surrounding neighborhoods. I had a private tour with Jack scheduled through Visit Oxford. The kind-eyed gentleman, a fifth generation Oxonian with a white beard and aquiline nose, took me through Antebellum manors and , the preserved home of William Faulkner, sharing personal stories about his encounters with the writer as he pointed out Faulkner's regular walking route through town. He recommended I check out for scientific instruments and southern folk art and (one of the world's largest) for listening and learning. Entering The Grove. Photo by Daniel Schwartz. Ole Miss Rebels vs. Arkansas Razorbacks. Photo by Daniel Schwartz. Between September and January when the Rebels are playing at home, football is the weekend activity. 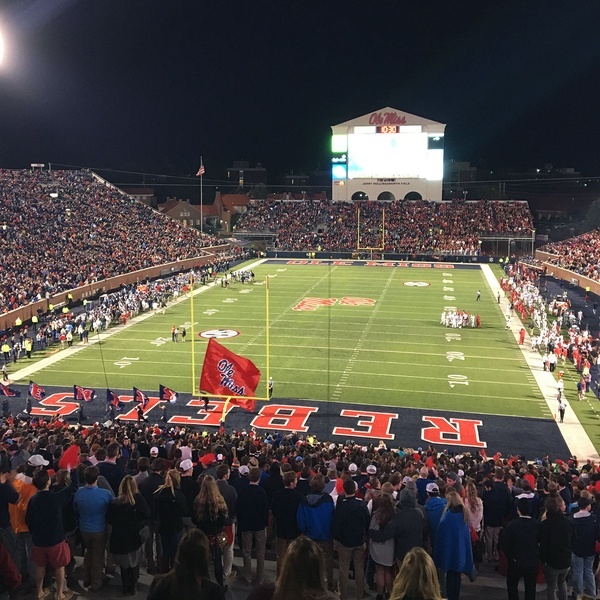 Fans from across the region flock to Oxford on Friday from the Saturday game, transforming the small town of 20,000 into a spirited demonstration of extreme fandom of nearly 100,000. 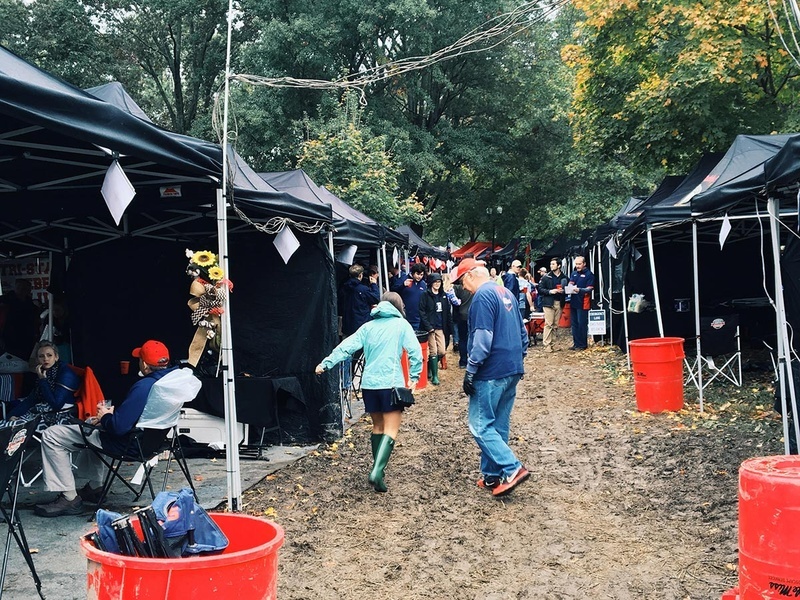 On game day, everyone swarms to The Grove, a ten-acre woodsy patch in the middle of Ole Miss, for one of the nation's rowdiest, most elaborate pre-game tailgating parties. For me, it was beautiful mayhem. I attended a morning tailgate for an afternoon game. Locals were drinking by 8 a.m., and by 11, the entire town was en route to Ole Miss and the Grove, where blue and red tents (team colors) filled with furniture, full-service bars, catered cooking, dessert towers, and live music stretched as far as I could see. Many had satellite dishes for those who wanted pre-game analysis or couldn't make it inside the stadium. It helps to know someone for access, since most of the territory is apportioned by gentleman's agreement to fraternities, sororities, and self-associating fan groups. There are some open patches and locals are incredibly hospitable, even to fans of the opposing team. But I'd ask before pitching a spot. Southern manners are Southern manners, and these folks are territorial. I'm not a big football person, but I stuck around for the game and I'm glad I did. Inside the stadium, the energy is electric. From the megatron, celebrities incite the crowd to scream the school's signature war cry, "Hotty Toddy." (.) Watching men in bowties and ladies in heels and cocktail dresses react to plays is an object lesson that football is more than sport in local culture; it's a way of life. And even when the Rebels lose, the post-game atmosphere is upbeat. After all, the priceless motto around town is, "We may not win every game, but we've never lost a party." 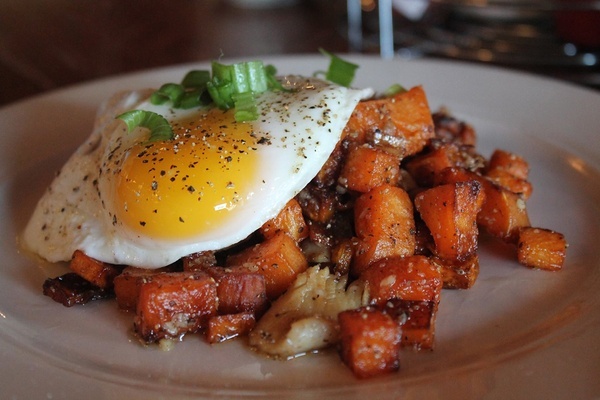 Sweet potato and smoked trout hash. Photo courtesy of Big Bad Breakfast. I ate every three hours in Oxford. This is a serious food town, where the options range from classic fried soul food to sophisticated, award-winning cuisine. My food coma lasted from day one until a week after I got home. And I loved it. 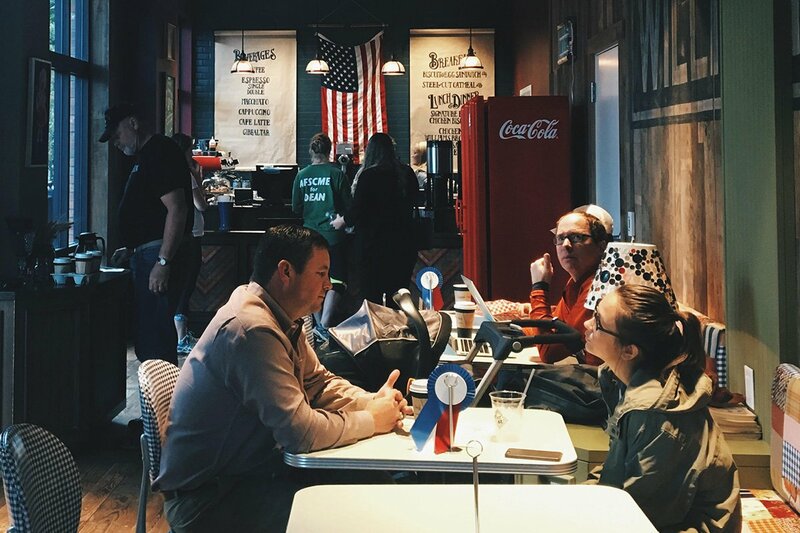 at Graduate Oxford serves juicy fried chicken biscuits, hearty sausages from local general store Williams Brothers, and La Colombe coffee. has great oatmeal raisin cookies and a cozy coffeeshop vibe. , a John Currence joint, upgrades the early meal with inventive specials and old-school staples like house-cured Tabasco and brown sugar bacon, Coca-Cola-brined fried chicken, and local Grit Girl grits. The wait is almost an hour at opening, but only a few minutes for solo diners at the bar. is a local favorite and fills up quickly. The soul food offerings are extensive, and the highlights are anything catfish, oyster, or shrimp paired with the veggie sides — cheese grits, fried okra, and cornbread dressing (think: stuffing). , a Memphis eatery from chef Kelly English of , now has an Oxford outpost and makes excellent po'boys with bread flown in from New Orleans. I went rogue by not ordering a traditional shrimp po boy, and I loved the Verno (braised chicken thighs with Swiss). On my next visit, I'm eating at , a 100-year-old restaurant fifteen minutes out of town famous for its catfish. I heard great things about , a hard-to-find spot down an alley off the square that serves fresh juices (which I desperately needed by day two) and good to-go bites like pepper, potato, and egg breakfast tacos. If I don't make it to the original in Memphis (which I was told I should visit before any of their other eleven locations), I'll stop into their Oxford location. Everyone I talked to was crazy about this chain. John Currence runs the show in Oxford. I ate at , the oldest and most renowned of his restaurants, where candlelight, classy clientele, and white tablecloths foreshadow sophisticated twists on regional staples like shrimp and grits, smoked crawfish mousse, and duck confit. Not surprisingly, the local tomato salad, the only light dish I had on my trip, was a highlight. Currence's is a casual, two-floor Creole eatery where I only had drinks. I wish I had had room for crawfish baskets and chicken cutlet sandwiches with spicy Cajun gravy. I didn't make it at all to , Currence's Mississippi-influenced brasserie with an awesome oyster program. Rob Long, Vice President of Southern Foodways Alliance and a Popupla contributor, had recommended it for chef Vishwesh Bhatt, whose influence is obvious in dishes like black pepper masala fried quail and hariyali duck. The last outpost of the empire is which has the only pit-smoked, whole hog barbecue in Mississippi and donates all profits to charity. Which is not to say it's all Currence all the time. has heavenly steaks and reliable fish dishes served with local vegetables. According to locals, there is such a thing as top-notch sushi in Oxford. And it can be found at . 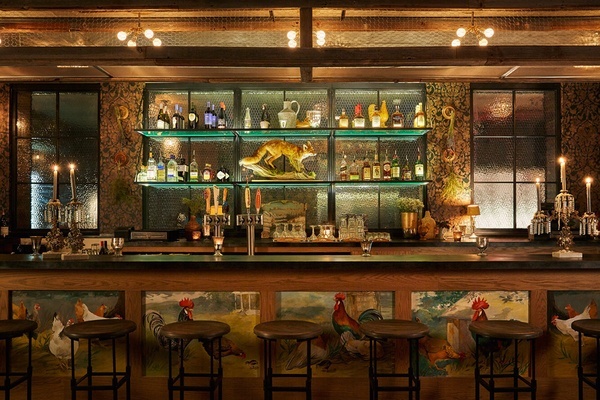 The beautiful bar at The Coop. Photo by Christian Horan Photography. The upstairs bar at City Grocery has classic cocktails and a charming terrace overlooking the square. , above Venice Pizza Co., and Bouré also have square views, but can get crowded. at Graduate Oxford, the only rooftop bar in town, serves Southern-style cocktails and late-night snacks like tamales, bologna (in local lingo, Tennesse long steak) sliders, and addicting queso dip. If you're not sipping above ground, you're drinking in the depths of college bars like , which has tons of TVs, a smoke machine, and lines out the door on football weekend nights. 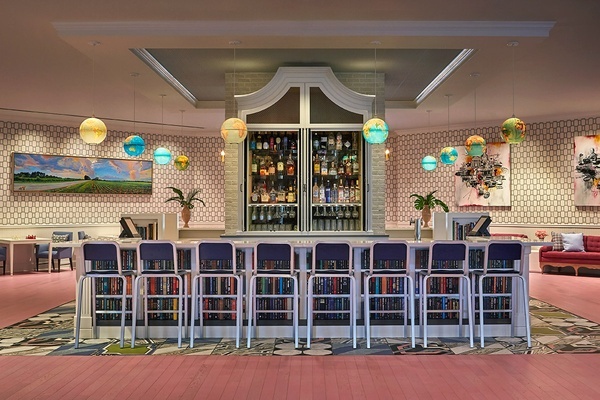 is the newest addition to Graduate Hotels' chain of college town boutiques. And you won't find anything like it in town. (Other lodging options include off-square Super 8s and small inns.) The 136-room hotel, located two blocks from the square, sits on land formerly occupied by Cedar Oaks, an antebellum mansion built by local architect William G. Turner in 1859 that was cut in half and transported up North Lamar Boulevard where it currently rests. Graduate recreates college living in an alternate universe, one where dormitories have a full-service lobby bar, a rooftop restaurant, insanely comfortable beds, and Malin & Goetz toiletries. Rooms start at $140 during off-season and jump to $270 during football months. Options range from 325-square-foot singles to spacious suites that are named after hometown heroes (Charlie Conerly Jr., William Morris) and curated with their memorabilia. 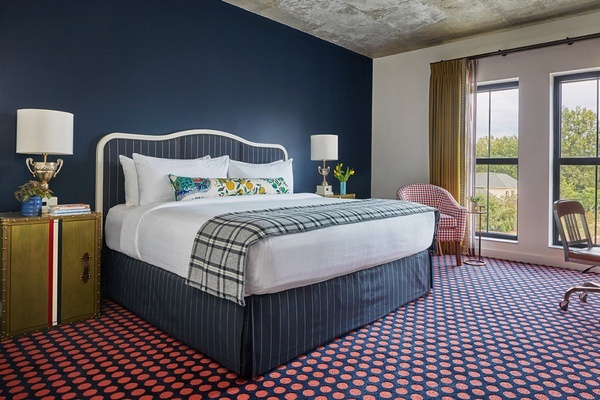 The hotel's interiors are preppy and collegiate — plaid carpets, trophy lamps, and, in the lobby, h sofas with charging ports and classic literature. Design pays homage to Oxford culture. Artwork includes silhouettes of Archie and Olivia Manning (local heroes), a portrait of Miss America (local obsession), and a map of tents in The Grove (local pasttime). 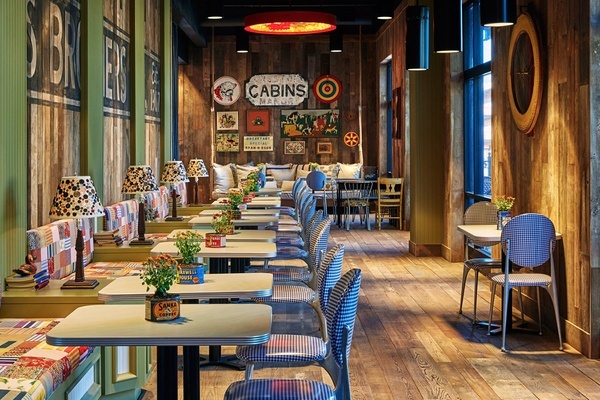 Cabin 82, the first-floor cafe, is modeled after the cabins at Neshoba County Fair, a historic state-wide gathering of families, live music, horse racing, and pageantry. The lobby bar. Hotel photos by Christian Horan Photography. A king-sized room at Graduate. Memphis International Airport (MEM) is an hour and twenty minutes drive to Oxford. Uber doesn't service the area. is the luxury option, with roundtrips at $400. is the alternative, with $100 one-way drives, but I can't vouch for the ride. A rental car may be the cheapest option, but unless you're visiting the delta or tracing the Blues Trail, you won't be using it much once you get to Oxford. The town turns up during NCAA Division I football season from September to January. If you can't stand crowds, visit during the off-season. Note that Mississippi is hot and humid in spring and summer, generally sunny with sporadic intense thunderstorms. I started listening to Adam Klein, Mark Edgar Stuart, and Aaron Lee Tasjan after hearing them at Thacker Mountain Radio, which you can listen to online at 6 p.m. EST on Saturdays on . The ESPN movie , adapted from an article by sports writer Wright Thompson, gives perspective on the impact of racial integration and football on the local community. is the most detailed of William Faulkner's novels set in the fictional county of Yoknapatawpha, inspired by Lafayette County and the former residents of Oxford. If patience and focus aren't your strong points, Faulkner's also give a good sense of the attitudes and history of Mississippi.